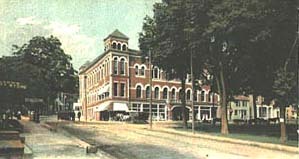 This penny postcard view of the Park Block, 40 Park Place, depicts Newtons first Department Store in about 1905. The W. D. Ackerson Company occupied the main store room. Signs also advertise offices of the Sussex Telephone Company. The sign on the Ewald Building (9-11 Main) to the left advertises Miller's Variety Store. The Park Block, as designed in Romanesque Revival style by Cr. E. Barber of Knoxville, Tennessee, stood three stories with outside walls 50' in height. There were towers on three corners adjoining the streets and the top of the tower at the intersection of Main Street and Park Place contained a room, 14' square, with balcony. It was erected for merchants Huston, VanBlarcom & Ackerson who purchased the Anderson property, corner of Main Street and Park Place, on February 18, 1895. Masonry contractors, ODonnell & McManiman, used brick from Franklin Losees Newton Brickyard, together with limestone and slate from Newton quarries, to achieve a polychromatic exterior. Thomas Farrell, foreman for Simeon Cook, did the carpentry. The first brick was laid September 8, 1896. Park Block opened March 1, 1897, with Newton Business College located on the third floor. 300. The third floor contained theater galleries. In 1910, Lehman Food and Department Store and Edward A. Muirs New York Store replaced W. D. Ackersons Market Co. In July 1937, Henry Christine installed eight howling alleys in the old theater. On May 1, 1939, the Big Leader Store opened in space formerly occupied by Muirs Store and Lehmans Market, and the two store rooms were opened into one, large, self-service market. Park Block was gutted by fire on December 3, 1940. In 1941, the George Osman Wrecking Co. of Jersey City took down the walls facing Park Place while the other walls were cut down to about 20' above sidewalk level. The Big Leader Store awarded a contract to William I. Houghton, Inc. in April 1941 to renovate the building in "Colonial design," one story in height, with a plate-glass and porcelain-finish store front on Park Place. The alterations cost $429,300. The street entrance was located in the center of the store facing Park Place at the former location of the stairs leading to the second story of the Park Block. Sixty-two inverted florescent lamps lighted the interior. The store room, 80 by 94 feet, accommodated 94 feet of cases in the food and delicatessan departments, 100 feet of vegetable racks, and a fully equipped shoe repair departmenmt. The Big Leader opened in its renovated quarters on September 19, 1941, with Morris Treiser as general manager. On April 20, 1967, the Big Leader building was purchased by Kymer Realty Company. The supermarket was converted to offices and renamed "The Kymer Building." Ground was broken for the new banking house of the Newton Trust Company on June 3, 1902. The original Romanesque Revival bank building (see view to right), designed by Marcus Houmann of Paterson, New Jersey, was erected by Newton contractors, ODonnell & McManiman. A large plate-glass window, 12-foot square, was installed in January 1903. The Newton Trust Company, 30 Park Place, is today a neoclassical banking house with colossal engaged columns, showing Beaux Arts influence (particularly in the use of a light-colored stone facade with rinceau frieze and Corinthian capitals). Its present appearance (see above postcard view) dates to an enlargement made between 1923 and 1925, according to architectural plans by Holmes & Winslow of New York City, specialists in bank construction. The Trust Company enlargement (1923-25) entirely masks the original Romanesque Revival bank building built in 1902. In September 1923, William Houghton of Somerville began work on the addition, 30' by 72', one story in the rear, covered by skylights, but two stories to a depth of 35 feet. A new facade was built of granite with an entrance in the center. The Trust Company opened with a public reception on November 19-20, 1925. The bank parking lot partly occupies the former site of the Newton Methodist Church, erected in 1859-61 and razed in 1963. In March 1929, Colonel Hugh Kelly of the firm of Kelly & Cowan, architects of Jersey City, submitted plans for a new County Clerk s building of brick and steel construction. According to partner LeRoy Cowan, the new building would be a model of Colonial Architecture," its facade "decorated with pillars" to correspond with the Court House. The contract was awarded to Reliable Construction Co. of Cliffside, New Jersey. The new firm of Joseph Straulina & Ivan Wright of Newton installed plumbing and S. J. Cranford of Jersey City supplied the heating system. 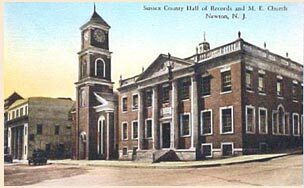 The new County Hall of Records was occupied in July 1930.